Excerpt from The Heritage of Rockingham County North Carolina 1983 "There have been generations of people by the names of Goins, Hickmans, Kyles, Harris, Lyles, Richardson, Kimmons, Gibsons and a few other names. - These people have many features of Indian, Portuguese, and other nationalities." Thomas Gibson died in Henry County, Virginia in 1780, his will written on January 3rd it names his wife, Mary, and only one daughter, Cuzziah. Zackeriah King, Joel Gibson and Lambert Dotson were named as executors. Joel and Charles More along with Joseph Nicols were witness to the will. On March 23, 1780 it was probated and the records show; exhibited by Joel Gibson who gave bond with Lambeth Dodson and Champain Gibson as his securities. Further records shows On 22 June 1765, according to the Pittsylvania County patent book, Lambeth patented 400 acres on the main fork of Mayo River which he transferred to George Gibson on 19 September 1766. Lambeth entered 228 acres in Guilford County, North Carolina on 9 January 1779 (Rockingham formed from Guilford in 1785). It was surveyed 10 June 1779 by Joshua Smith, with William Kellam and Joel Gibson acting as chain carriers. The grant was issued 1 March 1780, 228 acres below and in the fork of Mayo River, beginning at a poplar on the south bank of the North Fork of Mayo in the Virginia line, adjoining Joel Gibson and Philip Angling, and including the improvements of Thomas Gibson and Esaw Dodson. On 9 July 1784, Lambeth Dodson of Henry County, Virginia sold 153 acres of this tract to Zachariah King of Guilford County, North Carolina. From Pittsylvania County Court Records - Applications to raise dams for grist mills is George Gibson on Crooked Creek dated June 1772. (i) In 1823 Jemima Gibson living in Hawkins County gave power of attorney to Tyre Gibson of Hawkins County, Tennessee. Tyre Gibson may be the same man bailed out of the Lee County jail in 1822 and possibly a brother of Vardy's wife, 'Spanish Peggy Gibson? Was Jemima married to Tyre Gibson? (iv) Margaret married William Moore and resided in Rockingham County. (v) Jane married Johnson Goin and remained in Rockingham also. Likely the source of many of the Goinstown Indians. 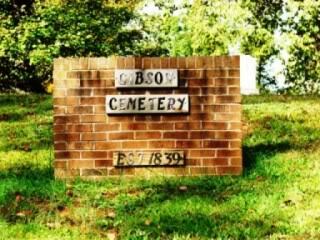 (viiii) Pleasant Gibson served in the War of 1812 Lived in the Goinstown community on the Rockingham and Stokes County border until the 1850s and then moved over to what would become Quaker Gap Township in Stokes County. In 1826 he bought the rights of sister Chaney and her husband James Harris, 19 acres on Hickory Creek and in 1832 bought the 19 acres of his sister Fanny Rogers. I am researching the family of Ansel Rogers and his wife, Fannie (or Frances) Gibson. Ansel was born about 1766, likely in Cumberland County, VA and was the son of Prudence Rogers. I would love to connect with anyone searching these lines! I have a fairly extensive set of data on them I'm more than willing to share. He and mother Prudence moved to Campbell County, VA by 1780s where they bought land - near a Jenkins family. By 1810, Ansel is in Henry County, VA where he marries Frances GIBSON, the daughter of Champ GIBSON. Ansel and his family are known as "free persons of color" or "mulatto" at least through 1870 census when some of his lines become "white". I can find court and military records for grandsons of his which call themselves "Portuguese". in Cumberland Co, VA in mid 1700s, I doubt that claim myself). - Spicey Rogers (married Squire SHAVER) was in SC, TN but then disappears. son of Ansel, he was not mentioned in James Rogers' application. Riddle a brother to William (Tory) Riddle and sons of Moses and Mary Ridley/Riddle of Orange County, NC and Henry County, Va. According to John Ridley/Riddle's Pension application (S9069) Soldier was born near Flat River in NC, John Ridle and William Ridle are both recorded on the 1773 Montgomery County, Virginia tax list of John Montgomery, both John and William took Oath of Allegiance in Montgomery County in 1777. Lewis Goins was born around 1813 in Rockingham County, North Carolina and is likely the son of Johnson and Jane Gibson Goins, grandson of Champ Gibson. Around 1855 Lewis left Rockingham County and removed to Rogersville, Tennessee where his mothr's sisters, Elizabeth (Riddle) and Chaney (Harris) had moved some time before. John Goins had land on Blackberry Creek, William King and Zachariah King also had land on Blackberry Creek. Zachariah King was mentioned in the will of Thomas Gibson in 1780 along with Joel and Champ Gibson. James is possibly the father of Johnson Goins who married to Champ Gibson's daughter about 1795. These King, Gibson and Goins families are found in East Tennessee later. By 1870 the Cornelius Harris and Obediah Riddle family moved to Paoli, Orange County, Indiana. 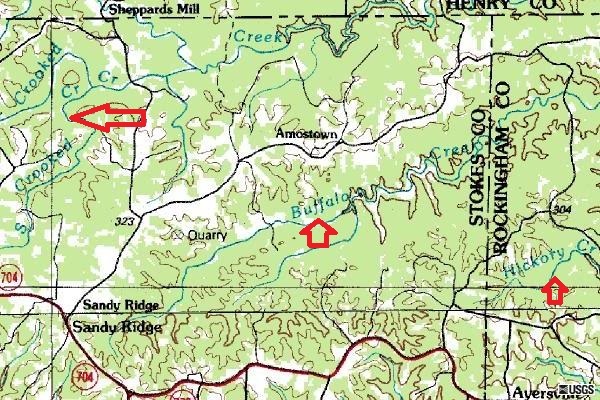 Joel Gibson on Buffallo Creek and Mayo - Champ Gibson on Hickory Creek and Mayo and Crooked Creek in upper right hand corner in Henry County is where George Gibson had land in 1772, probably from Lambert Dodson. March 1, 1780 - Lambeth Dodson 228 acres below and in fork of Mayo joining Virginia line Both sides of S fork opposite land of Joel Gibson. March 1, 1780 - Champ Gibson 300 acres on both sides of Hicory Creek of Mayo River joining Alexander Lyell and both sides of (several) creeks. 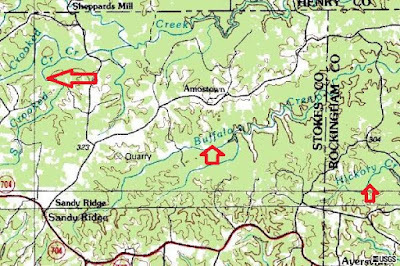 March 1, 1780 - James Brison 400 acres on the south side of Mayo river joining the sd river below the Mouth of Buffaloe Creek, both sides of (several) branches, and both sides of the sd Creek Opposite (land) of Joel Gibson and Andrew Gibson.